Although this may seem like a daunting task it’s not so bad once you know the steps. There are about five or six easy to follow steps in order to be able to perform this task yourself. The first thing you should do is make sure your vehicle is on sturdy ramps or jacks in order to proceed safely. The second step will be to make sure you have the right size wrench, usually 13mm although some vehicles may be different from others. Most nuts can be freed by use of a ratchet, making it easier, but you should also have a wrench on hand in case one or two of the bolts are not so easily accessible. 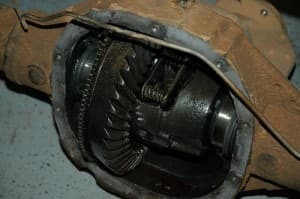 Once all the bolts are removed from the differential cover pan you will probably need a flat head screwdriver, or something similar, to pry off the cover. If there are brake lines close to the cover pan be sure not to bend them as this can impair their functionality. Once the cover pan is removed the oil will flow freely out of the pan so be sure to have a large enough bowl to catch all the oil. Oil is extremely difficult to remove from concrete and other surfaces so it’s better to be safe than sorry. Some people use a large plastic bag but it would be safer to use a bowl or bucket. Once all the oil is drained, and this could take a while, you can mop up any excess with dry rags. You could also use a stiff brush to clean any excess buildup of gunk and if needed replace the old gasket, which usually needs replacing. You should also clean the cover pan and both surfaces where the new gasket will be replaced. Most people use a thin bead of Silicon to seal the gasket in place before replacing the cover, this creates a water tight seal so no oil can leak out once it has been replaced. One should check the owners manual for oil type although it is usually 80-90w gear oil in most differentials and manual transmissions. Finally, to replace the old oil with new, there should be a fill hole. Remove the plug and basically pump the new oil in until it starts to drip out of the hole, this shows it is full and then you just need to replace the plug.